Julia is eleven-years-old and has been riding at Lancers for three years. 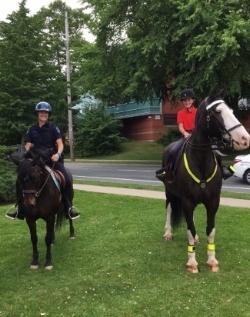 She is in ride 5 and also rides in the three times a week program. While Julia may still be one of our smallest riders at the barn, don’t let her pint-size fool you as she is an extremely capable rider for her age and size! Her favourite horses are Alice and Tootsie. This year Julia started attending off-property horse shows and she did amazingly well! At her first off-property show (the Windsor Mega show) she rode Alice and came first place out of twenty horses in the cross rail division. Julia is also a Lancer Pony Club member and took part in the Pony Club quiz and the Prince Philip Games. 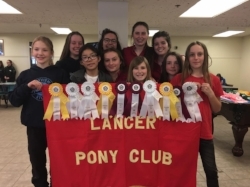 Julia has spent some time at Saddlewood, a summer riding camp in Bethany, Ontario and in her spare time at Lancers, she can often be found with her fellow riding mates jumping over jumps on foot without horses. In fact, Julia’s whole ride is always around the barn together and it is great to see such tight-knit friendships growing here at Lancers. She (and her parents) were a great help at Spruce up the Barn Day in the spring and at the Downtown Horse Show. She is always very helpful around the barn and never says no when asked to help. She sometimes even helps with the junior beginner course on Saturdays. In the future, we’re sure that Julia hopes to have a long and successful show career ahead of her. She is such a hard worker and is so dedicated and determined to succeed in this sport. Thank you, Julia, for being such a committed Lancer. We look forward to having you at Lancers for many more years!